Community Building Day is an annual Whitworth event that began in 1907 as a student-led campus-beautification endeavor called Campus Day. In the mid-1990s, the event evolved into a partnership between local nonprofit organizations and Whitworth volunteers who work on clean-up and improvement projects throughout Spokane. Unique to this year’s event is an address given by President Taylor at Holmes Elementary School at 8:45 a.m., and an on-campus student-led workshop on how families can use digital and social-media tools to communicate during challenging times. 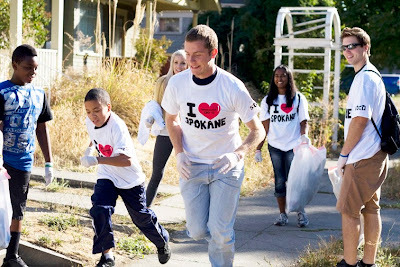 Community Building Day is foundational in fostering a lifelong ethic of social and civic responsibility in Whitworth students; it also provides valuable services to nonprofit agencies across Spokane. Reflecting Whitworth’s longtime partnership with the West Central neighborhood, President Taylor will speak at Holmes Elementary School from 8:45 to 9:15 a.m. during Community Building Day. Afterward, he and Julie will serve at Holmes by handing out materials for a student-led cleanup effort in the neighborhood, led by over 120 Whitworth students and all of Holmes’ sixth graders. They will also accompany students who will be distributing CFL light bulbs door-to-door, through a partnership with Sustainable Works. Whitworth, along with Gonzaga University and Spokane Public Schools, was recently awarded a $500,000 grant by the state legislature in support of a partnership that provides the elementary school with teaching, learning and technological resources. Assistant Professor of Communication Studies Erica Salkin will have her students lead a social-media workshop, “Compassion 2.0,” as part of their Community Building Day experience. The workshop is free and open to the public. Students will help attendees learn how digital and social-media tools can be used to help families communicate during challenging times, especially in relation to medical and health issues. Pairs of students will work with individuals to help them better understand and use social media and other digital tools. Two workshop sessions will be offered; the first is from 9-10:30 a.m., and the second is from 10:30 a.m.-12 p.m. Both will take place at Whitworth, in Hawthorne Hall, Room 112. Hawthorne Hall is located at the corner of Division St. and Hawthorne Road, in north Spokane. For more information about the workshop, please call Erica Salkin at 509.777-4704 or e-mail esalkin@whitworth.edu. Other volunteer sites for Community Building Day 2013 include Rockwood at Hawthorne retirement community, Arc of Spokane, Mission Community Outreach, Hutton Settlement, Christ Kitchen, Catholic Charities, Union Gospel Mission, Spokane Humane Society, Liberty Park Child Development Center, Anna Ogden Hall, Project Hope, Mission Community Outreach, St. Luke’s Lutheran Church, and Whitworth’s Verbrugge Environmental Center. Community Building Day will take place from 8:30-11:30 a.m. Volunteers will gather at 11:45 a.m. outside the Hixson Union Building on campus for a barbecue lunch. All Whitworth students, faculty, staff, alumni and supporters are encouraged to participate. Spokane community members may also volunteer at local churches or other nonprofit agencies on Sept. 17.